Akwaaba "Welcome" to Sankofa African Bazaar online. 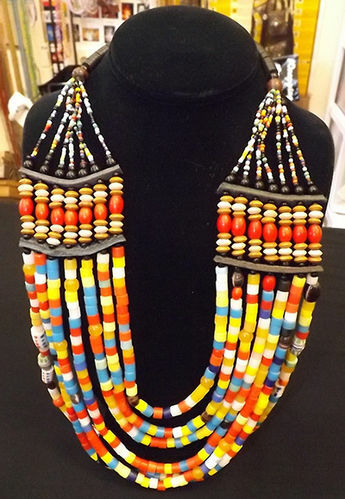 We feature museum-quality African/African-American Art Gallery, Unique Ethnic clothing, jewelry, and accessories, and amazing gifts. This shirt is made from 100% polished cotton. The body of the shirt is skillfully embroidered in an elaborate style. The color of the embroidery may be customized. This shirt can be dressed up when worn with black slacks, or it can be dressed down and worn with khakis or jeans. Either way, you'll receive lots of compliments in this shirt. Ibo (Igbo) - used in MMO or MWO secret society funtions - Nigeria. This item's height is 19 3/4 inches. This shirt is made from 100% polished cotton. The body of the shirt is white and it's skillfully embroidered in an elaborate style. The color of the embroidery may be customized. This shirt can be dressed up when worn with black slacks, or it can be dressed down and worn with khakis or jeans. Either way, you'll receive lots of compliments in this shirt. Linga Koba dolls are from the Ndebele people in Southern Africa. One of the smallest tribes of the region, the Ndebele are noted for their painted homes of brilliant colors that stand out in the drab countryside. Their clothing is similarly colorful. 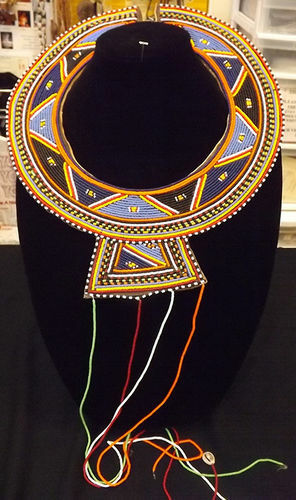 The bead work on these Ndebele dolls is as detailed as the clothing of the women themselves. During courtship, a suitor will place a doll outside a young woman's hut, indicating his intention to propose marriage to her. When a young woman is preparing to marry, she is given a doll that she names and cares for. Her first child is then named for the doll. 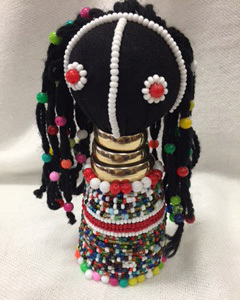 In addition to strengthening the Ndebele cultural identity, the beaded Ndebele dolls are now an important export item and much needed source of income for the Ndebele woman. These dolls are 5" - 6" inches high. Each doll is unique and will vary in bead colors. These dolls are 12" high. No two styles are alike; each design may vary from the photo. One size fits 62” chest and has a 32” length. Made in Mali. Stunning, striking, and guaranteed to catch the eye. Rich, warm earth tones of genuine African mudcloth glorify the intensity of African style. Here's your opportunity to own popular, one of a kind clothing with pride. No two styles are alike; each design varies. Photo is representative only. One size fits 42” chest and has a 32” length. Short sleeve length can vary. Just in time for winter. Authentic, indingo colored Mudcloth was used to create this lavish, mid length coat. Fully lined. Completely one-of-a-kind, each coat is fully lined with mudcloth and has a soft swing style. Hand-painted designs that are all done by different artists, making each coat completely unique. Coats may come with velcro, buttons, or a zipper front. One size fits all; 48-58" bust and 30” length. Made in Mali. Just in time for winter. 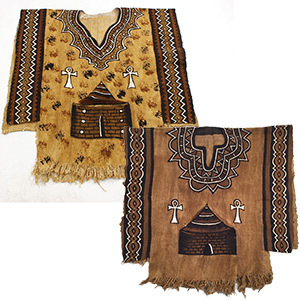 Authentic, black and white colored Mudcloth was used to create this lavish, mid length coat. Fully lined. Completely one-of-a-kind, each coat is fully lined with mudcloth and has a soft swing style. Hand-painted designs that are all done by different artists, making each coat completely unique. Coats may come with velcro, buttons, or a zipper front. One size fits all; 48-58" bust and 30” length. Made in Mali.